Suggested Additions: butter poached lobster meat – as an entree side. Organic Coconut Chicken Bites, children’s menu. Oysters on the Half Shell – oysters from the Dennis oyster farm – plump and juicy and some of the best on Cape Cod – served with organic cocktail sauce, oyster crackers, and shallot mignonette sauce. Clam Chowder Mugs – Beach Plum Chef Recipe – a light chowder with clams and white fish, onion, sweet corn, fresh herbs – finished with cream. 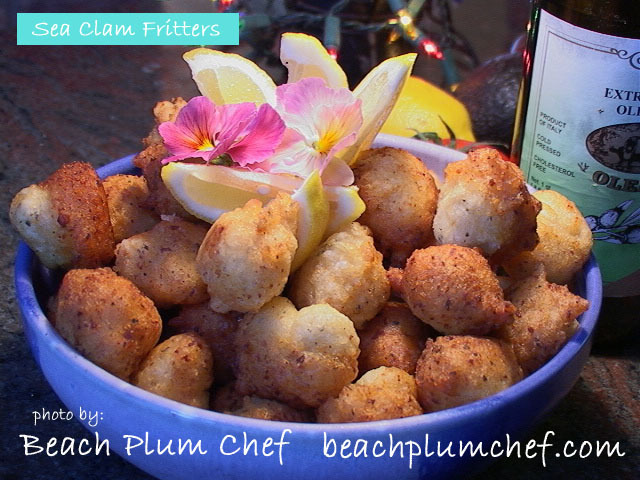 Served w a basket of Spicy Fried Clam Fritters – Beach Plum Chef Recipe – ground quahog, stone ground flour, spicy chopped red pepper, spices/ fried just before serving. Grilled Sirloin Steak – marinated w red wine and garlic, served with pan juices. Chicken Piccata – Bell and Evans chicken breast, thinly pounded and cooked in a brown butter and caper sauce with lemon and fresh parsley. Dessert: Raspberry Peach Crisp w Homemade Whipped Cream – served warm. Original Menu Beach Plum Chef of Cape Cod Copyright March 2012. All Rights Reserved, Please do not reprint without permission.